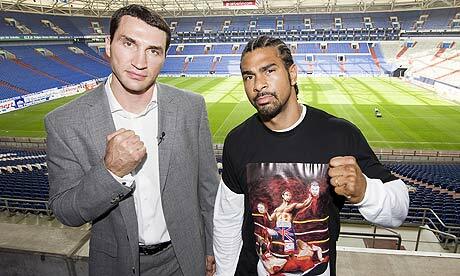 Today Sky Sports News has been busy promoting the world heavyweight title fight between David Haye and Wladimir Klitschko, during an interview Haye was asked whether he would wear the controversial t-shirt (seen here) to the Imtech Arena in Germany on 2 July, Haye confirmed this and then went on to announce a new app available for iTunes. The app is called David Haye’s Knockout and has been developed by Grubby Hands, it costs $2.99 / £1.79 and will run on iPhone, iPod touch, and iPad as long as you are running iOS 3.1.2 or later. You can check it out for yourself here. Despite the cheesy gimmick it is said to be a pretty decent game where players must use speed, agility and reflexes to knockout an “anonymous Russian heavyweight”, apparently in the game you can knock this boxer’s head off. Why not check out the app for yourself now and leave us a comment below letting us know whether it is worth buying, Haye certainly made it sound great.